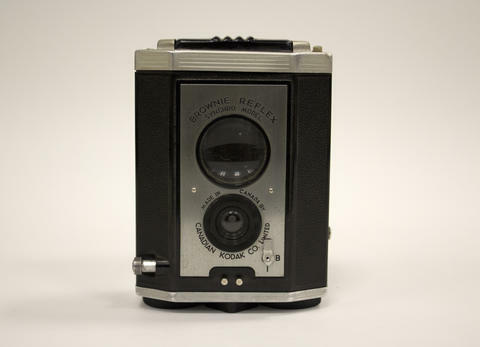 Item consists of a Brownie Reflex Synchro Model, made in Canada by the Canadian Kodak Co. Limited. It has a twin-lens reflex pattern and a large finder with a folding hood. It uses 127 film, a rotary shutter, and has a meniscus lens. It is in the original box with two manual booklets and has a fabric braid strap. Good. In original box with two manuals. Item is from the PPCM donation, accession number 2013.002. Moved to the Heritage Camera Collection in 2013.